At least we won... Something just didn't seem right. The Pens' opening game vs the Flyers on Thursday afternoon seemed way too clean, almost so much so that it lacked the intensity of a usual Pens/Flyers game. Looks like their AHL affiliates tried to split the difference. The Penguins defeated the Phantoms in a game that looked more like a WWE fight night than it did a hockey night. The 2 teams totalled 66 PIMs, which is a lot considering only 30 of those PIMs came from misconducts. That leaves 18, count 'em, 18 minor penalties (7 Pens, 11 ADK). One would think that with all those penalties that either the score would be high or the powerplays must be horrible. As you probably guessed, it was the latter. The Pens scored on one of their opportunities, but left the other 9 powerplay chances with empty boxes on the scoresheet. (So maybe it wasn't all Reirden's fault) Adirondack was no better, squandering all 6 of their chances on the man advantage. But enough of that, let's focus on what the Pens did well and why they kept their East Division lead. Tim Wallace clearly came out to play, scoring the equalizer (and the Pens' lone PP goal) and contributing with his physical play throughout the game. Wallace was a thorn in the side of the Phantoms until all the tension finally manifested with 3 seconds to go in the game with a scrap that saw Wallace, Robert Bortuzzo, and Phantoms' Patrick Maroon ejected. 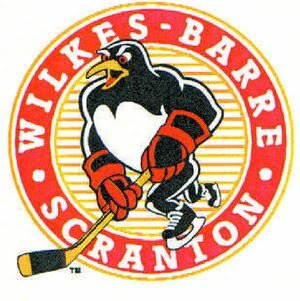 Joe Vitale notched the other score for the Pens, while Zac Rinaldo put up the lone tally for Adirondack just 42 seconds into the game. Rinaldo's goal seemed to take all of the air out of Mohegan Sun Arena, and immediately some fans who aren't firm believers in starting goaltender John Curry started to make themselves heard. John quickly quieted them down by stopping all 25 of the remaining shots he faced to preserve the win for the Pens and his first of the season. Drew Fata and Nick Petersen also made their season debuts, with Fata subbing in for Hutchinson (called up to Pittsburgh) and Peterson starting in place of Craig (scratched). The Pens next game is Friday, when they make their first ever road trip out to Charlotte to face the newly established Checkers for a 2 game mini-series.